View slideshow to accompany audio (PDF). Duncan Baker Brown has been a director of award-winning architects BBM Sustainable Design since 1993. He also teaches and researches around green ideas at the School of Architecture in Brighton. He has had the good fortune to work on some of the UK’s most high profile green developments such as The Greenwich Millennium Village, the RIBA’s Futurehouse and The House That Kevin Built. Ian Brown has been teaching low impact building and sustainable construction for many years and has built various low impact projects. He currently teaches straw bale building with Brighton Permaculture Trust and construction at City College Brighton. Mischa Hewitt is a sustainability consultant and project manager with a particular interest in affordable low energy buildings. He is a director of Low Carbon Trust, a director of Earthwise Construction, a Sussex-based green-sustainability consultancy, and a trustee of AECB, the Sustainable Building Association. He teaches a range of ecobuilding courses with Brighton Permaculture Trust. Cat Fletcher is a waste activist who sources and matches up tonnes of unwanted goods and materials with people who can reuse them – preventing untold local waste. A founder of UK’s Freegle reuse network (1.9 million members) she also manages the Brighton Freegle group (21,000 local members). Cat sourced most of the materials as part of the design team for award-winning Brighton Waste House at the University of Brighton – it’s 90% constructed with ‘waste’. She is currently the only Reuse Manager for a UK local authority and is ensuring that the city reuses resources wherever possible through innovative, collaborative and creative projects. Alex is a director of Hemp-LimeConstruct, a UK-based construction company specialising in the use of hempcrete and other natural building materials. Alex is co-author of The Hempcrete Book: Designing and building with hemp-lime and provides training and consultancy for builders, self-builders and architects who want to build with hempcrete. Rowland Keable has been building earth structures since 1985 and has worked extensively in Africa and the UK. He is the author of Rammed Earth: design and construction guidelines and teaches rammed earth building with Brighton Permaculture Trust. He is also a founder of Earth Building UK and director of Rammed Earth Consulting. 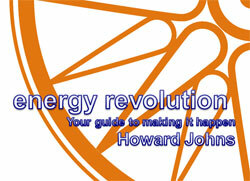 Howard Johns is a founding member of Ouse Valley Energy Services Company (OVESCO) as well as the founder of Southern Solar Ltd. He is the author of Energy Revolution: Your Guide to Repowering the Energy System and has been installing solar hot water systems and other small scale renewable energy systems for over ten years.